Executive Retreats, High-level Conferences, Informative Seminars, Intensive Training Sessions, Team Building Events, the list of reasons for organizations to meet goes on and on. One thing is for sure: The Norwich Inn has played host to these types of meetings, conferences and more for decades. From Fortune 500 companies to regional and national organizations, everyone understands the importance of creating a competent, galvanized management team. 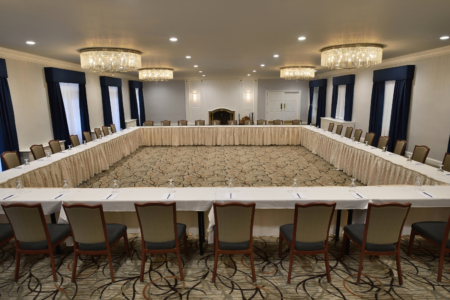 Meetings at our Connecticut conference space are productive, meaningful, and memorable. We offer a meeting package focused on simplicity that includes everything you’ll need to make your meeting a success. 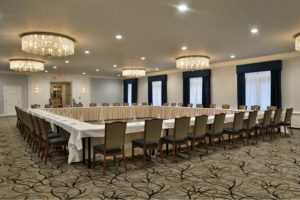 A premier full-service meeting venue in Connecticut, we are centrally located between Boston and New York City and less than an hour from Providence and Hartford. Easily accessible, incredibly convenient for all major forms of transportation, and next door to some of the area’s most exciting attractions, planning Meetings and Events at Norwich Inn couldn’t be easier. Located on the 42 acres adjacent to the main building are over 50 townhouses, offering a variety of room styles with features such as galley kitchens, private balconies and living rooms with wood-burning fireplaces. The Spa at Norwich Inn has received the “Best of the East” award nine times as an outstanding CT meeting facility, providing excellence in service and rated by the readers of Meetings East magazine. Minimum of 13 guestrooms per night, Sunday-Thursday, now through December 31, 2021 based on availability (new group bookings only). All packages need to be booked and consumed by December 31, 2021. To plan your next meeting, please contact Gary Baker, at 860.425.3682 or gmbaker@meetingsatnorwichinn.com. Our recent winter renovation is over! And we are happy to say that our Ballroom, Hunt Room, Lobby and Public space not only look fabulous, but stand tall against any of our competitors. New Carpet, New Wallcovering, New Lighting, New Furniture and so much more. View the Photo Gallery for more of our NEW Meeting Space Photos!